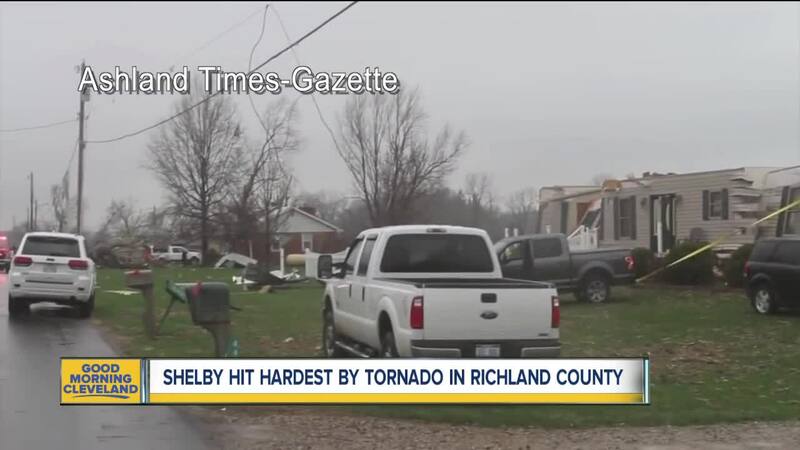 SHELBY, Ohio — The cleanup process is just getting started for residents in Shelby following a tornado Sunday that left widespread damage across Richland County. News 5 crews are in Shelby Monday morning looking at the damage. The National Weather Service has already confirmed a tornado touched down Sunday night. Investigators will be on site Monday to determine the strength of the tornado. Shelby Chief of Police is reporting minor injuries. In a Facebook post, police said it appears the tornado came from behind the area of Advance Auto and continued east across OH-39, affecting a number of structures in its path, with the heaviest damage at Rocket Chevy, Donley Ford, Drug Mart and Carton Service. The First Presbyterian Church at 24 North Gamble will be serving a hot breakfast starting at 7 a.m. Monday for anyone affected by the tornado or the people that are helping clean it up, according to the Shelby Police Department. Everyone in Shelby is in the dark until crews work to get the power back on. Mansfield Avenue, which has been hit the hardest by the tornado, has been closed since it came through because of the trees and downed power lines. News 5 viewers captured videos and images of funnel clouds, tornadoes forming, shelf clouds and the destruction these storms brought to the area. Images show Rocket Chevrolet, a car dealership in Shelby, was destroyed by the storm.